You will probably live forever* as the X-Jangle shields you from viruses, pollution and even bullets, just like Wonder Woman’s bracelets did! 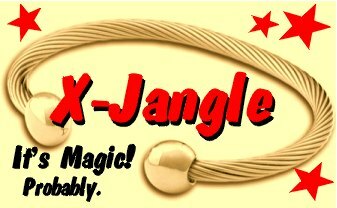 The X-Jangle can be yours for only 24 payments of just $65 (plus taxes, shipping, handling, convenience fee, insurance, convenience fee insurance, insurance handling insurance and $100 administration charge). * Excluding factors including diet, age, income, genetic predisposition, luck and whether God actually hates you. Tired of paying $$$ to Bob’s Taxidermy for your road kill trophies? Simply stuff it yourself with this awesome DIY taxidermy kit! 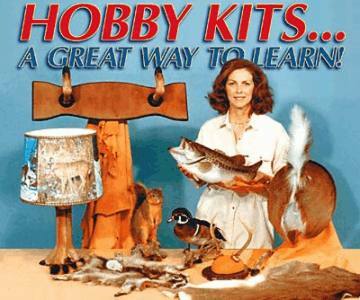 It contains all the tools and plastic sheeting you need to learn the ancient art of mammal mounting. * It’s easy when you know how! With a few careful incisions remove soft tissue, mucus and entrails from your subject. Stretch the remains around a mould, pop in some eyes and presto! Your friends will be so impressed they’ll be lining up at your door with piles of fresh kill just dying to be immortalized! * Don’t let the beloved former family pet rot away in a hole – the best monument to your pet IS your pet! Fluffy or Rover can now sit loyally on the fireplace or bookshelf forever. Help your kids through the grieving process by letting them help with their dead pet’s taxidermy treatment. It will make a great school science project. Wow! I nearly came when I saw these out-of-this-world super space suits! Frustrated shuttle pilots everywhere can indulge their fantasies with these cosmic costumes. Simply redecorate your garage or lounge in tin foil, and create high-tech controls from old switches and cereal boxes… and prepare to lift off! There’s no end of space fantasies I’d love to recreate inside my shiny capsule. * To enhance your galactic experience, hire a children’s bouncy castle and pretend to bounce your way across the moon or even Mars! Don’t forget – shoes off first. * For a hilarious prank, pretend you are a Cosmonaut who has crash-landed in your neighbour’s garden. Tell them in made-up Russian you need them to urgently phone Vladimir Putin, NASA and the nearest Radioactive Waste Decontamination Unit. They will be thrilled to have such fun-loving neighbours! 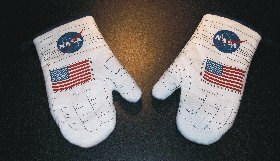 If you can’t afford to spend $$$ at The Space Store, simply pop over to the Kennedy Space Center and grab yourself a pair of these fetching high-tech intergalactic… oven gloves! As used on the space shuttle by Neil Armstrong! Probably. Are your kids blissfully ignorant about Jihad? Not exercising vigilance in the war on terror? Teach your kids to look out for lunatics with this fabulous toy Airport X-Ray machine! 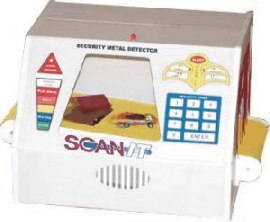 This realistic detection toy will give kids hours of fun as they attempt to identify hidden bombs, liquid explosives and bomb-making manuals from the comfort of the play room. Your children can recreate all the fun of the check-in gate! * The X-Ray machine’s light flashes when a box cutter or shoe bomb is detected! Kids will love playing ‘Cops and Bombers’ role-playing games with their little classmate Mohammed. * Teach kids about the dangers of drugs! Challenge your little Airport X-ray Agents to detect hidden packets of cocaine. See if they can identify the real drug from the decoys using sight, touch and taste. It may inspire them to become experts in illegal narcotics when they grow up!